At DELTAwater solutions, we provide an in-depth advisory service about water treatment systems Australia. Our experienced specialist staff, dealing through a vast network of agents Australia-wide and with international connections, analyse water samples and make recommendations on water treatment technology options. The first step is to give us a call on freecall 1800 283600 or contact your local pumps and irrigation agent and they will order the DELTA Water Sampling Kit for you. Testing your water is the essential first step in finding a solution for your water problems. Inside the water sampling kit you will find a water bottle to collect your sample in, some simple instructions, a questionnaire and a postage paid return envelope. We test our water samples under laboratory conditions, finding problems associated with calcium-magnesium mineral scale, hard water, iron, salinity, algae and corrosion. Test results ensure that our customer service manager and manufacturing department can provide water treatment recommendations for your specific problem, then supply a product to suit your needs or custom-design one for you. What types of water do we treat? The many different applications of the DELTA technology during the company’s 20-year history are endless. The company’s water treatment products have provided successful treatment solutions for water from bores, wells, creeks, rivers, town supplies and some dams and has also shown great results in waste-water and mining situations. DELTAwater solutions readily provides information and recommendations for a vast range of water uses from domestic, garden and stock-watering systems to irrigation, fruit and vegetables, hydroponics, swimming pools, evaporative air-conditioners, hot water systems, commercial coffee machines, processing plants and mining. DELTAwater solutions makes it easy for you to discover if you can improve your water supply with water treatment technology. 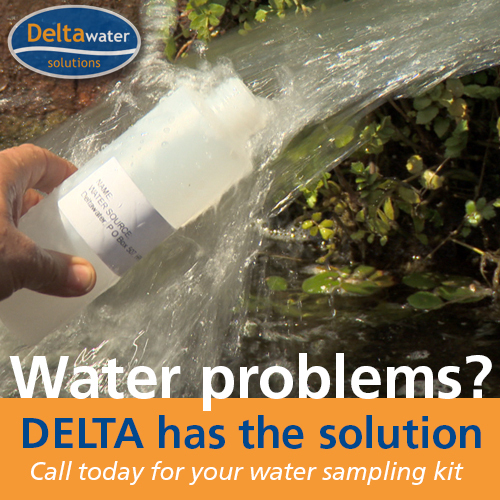 DELTA provides a Water Advisory Service and Water Sampling Kit which is really easy to use. 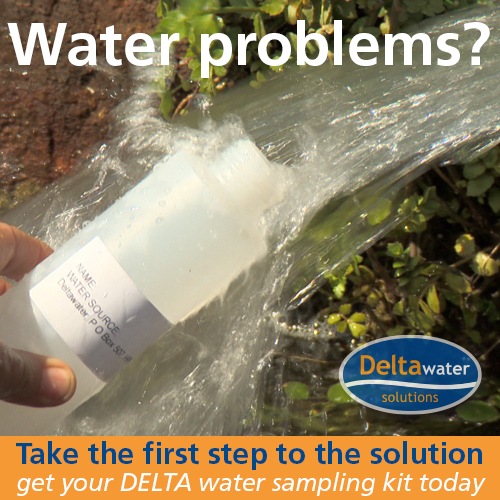 Customers can order kits from DELTAwater solutions agents right across Australia or by calling 1800 283 600 toll free. The kit includes a water-sample bottle and questionnaire. All you have to do is collect your sample and mail it with the completed questionnaire with your cheque for payment in the postage-paid envelope provided. We then test the sample, compile a full report and contact you personally to outline treatment options. We guarantee to either fax or email the report and then personally contact you by telephone within five working days of us receiving your water sample. Contact Us for more information or review our FAQs page to better understand DELTAwater solutions and the water problems we solve.